... Live In Europe 2007. Make no mistake, Barbra Streisand, even now at the age 65, is a star of the first firmament. The talk beforehand had been about exorbant ticket prices, but last night in Manchester, it was instead extraordinary vocal ability and enduring star quality that entranced a capacity crowd. At up to £600 a pop, its the hottest and most expensive ticket in town. 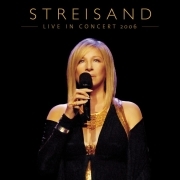 And as Barbra kicked off her UK tour in Manchester last night, the question on everyone's lips was: Is It worth it? For most of the die- hard Babs fans at the MEN Arena it was a resounding Yes. The Daily Express will run a review on Friday. Reviews will follow in this week's Observer and The Sunday Express. Click here to view the message board. BarbraNews.com has interviewed many of Barbra's colleagues and co-workers. Click on the following links to read one of the interviews. Lauren Frost -- Starred in Barbra's Timeless Shows as "Mini-Barbra"